Enjoy Eggs Benedict without feeling guilty. Butternut squash is high in beta-carotene and Vitamin A, all of which are good for eyesight and heart health. 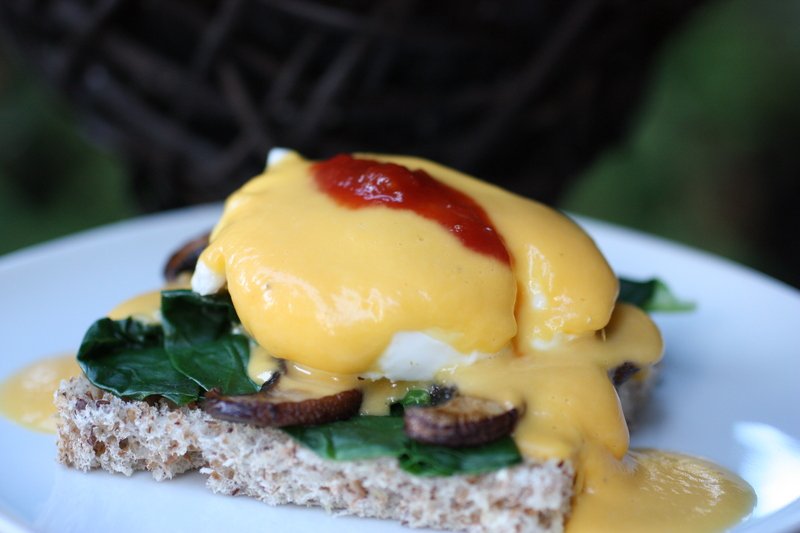 The hollandaise sauce is completely dairy free – which is also perfect for a vegan tofu benedict. 1Heat a stainless steel pot 3/4 full with water and add 1 tbsp of vinegar. 2Bring the water to a boil and then turn it to a simmer. 3Slowly crack the eggs one at a time into the water dropping the egg as close to the water as possible to avoid the yolk separating from the white. 4Cook the eggs for about 3 minutes, then remove them from the water with a wooden spoon. Drain off the excess water and set them aside. 5Keep the water and reheat if necessary. 6Heat another pot with boiling water and a pinch of salt for the collard green leaves and blanch them briefly until they turn bright green, then add them to some cold water immediately and set aside. 7Heat a small frying pan with the 1 tbsp of the avocado oil and then sauté the portobello mushroom until soft and season it with sea salt and pepper to taste. 8Heat the hollandaise in a small stainless steel pot over medium-high heat and set it aside. 9Toast the 2 pieces of bread and top each one with collard greens and the sliced mushrooms, followed by the poached eggs. Drizzle the eggs with hollandaise sauce. 10Garnish with the chili sauce and serve immediately.